Often, people want to know what your email campaigns will be like before they sign up to receive them. When you create a sample campaign, you can show potential subscribers exactly what to expect. In this article, you'll learn how to create a sample email campaign to share with potential subscribers. 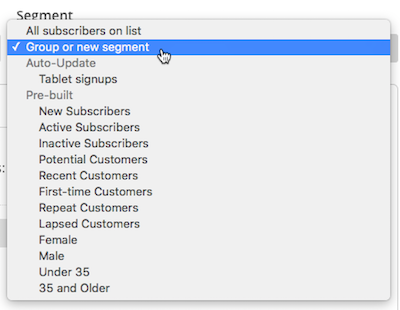 To create a sample campaign, you need a list that includes your email address as a subscribed contact. If you've already been sending campaigns, you can share the campaign URL for your sample campaign. We suggest using the campaign type as you'll use for future sends, so people get an accurate sense of what they'll receive from you. In this example, we'll create a regular campaign with our Email Designer. On the Regular tab, enter a campaign name and click Begin. In the To section of the Campaign Builder, click Add Recipients. In the List drop-down menu, choose the list you want to send to. In the Segment drop-down menu, choose Group or new segment. Set the conditions to Email | is | your email address. In the From section of the Campaign Builder, click Add From. Enter your from name and email address. You may be asked to verify the domain in your email address. In the Subject section, click Add Subject. In the Subject field, enter a subject line for your email. In the Preview text field, you can enter up to 150 characters that will display next to your subject line in recipients’ inboxes. This field is optional. In the Content section, click Design Email. On the Template step, choose your template. On the Design step, add your sample content. In the Share your campaign section, review your campaign URL and ensure that Facebook and Twitter sharing is disabled. After you’ve completed the To, From, Subject, and Content sections of the Campaign Builder, you should see a green checkmark next to each. That means you're ready to send your sample newsletter to yourself. To send your sample newsletter, follow these steps. In the Prepare for launch modal, click Send Now to confirm your send. Your sample campaign is on its way! After the campaign has sent successfully, you can share the campaign URL for your sample newsletter on your website, your signup form, or any time you send emails from your regular email program to invite people to join your list. You can also share a sent campaign on social media with the Social Share feature. An important distinction we make at Mailchimp is the difference between our templates vs. campaigns. Learn more about when to use each.